We have several mailing lists of people looking for the various Snuzzles Blankies animals. 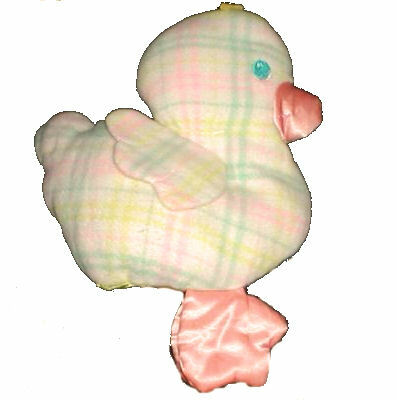 This Playskool Snuzzles duck, along with a Snuzzles baby doll, was given to me by my Dad the day I was born, and both truly became my “security blankets” as I grew up. There were a number of times that I tried to be tough and put them away in my forever box (something each child in my family has to hold on to things as we grow older), but I always had to take them back out for one reason or another. Whether it was the first trip I took without my parents, or going away to college, or when I made my first big move out of state, my ducky and baby came with me. Over the years, ducky has fallen apart, and until recently was in about five or six pieces, which I always kept together and with me in my pillow. Recently I made a trip home to visit, and one of my sisters got a new puppy. I didn’t know it, but the puppy is quite the climber, and while we were gone one day, she climbed up on to my bed and ate and/or tore up what was left of my ducky, except for the feet. I know it sounds sad, but I was really upset, and needless to say I have been searching for a replacement since. I didn’t know the name or brand, but finally came across it in the lost toys section of your website, and nearly jumped out of my chair. I realize that they are hard to find, but I when I saw that someone else was able to find one, I got a little hopeful that maybe I would be as fortunate. I will continue searching, but like I said before, any help would be greatly appreciated! Best of luck to you and or the mailing list.